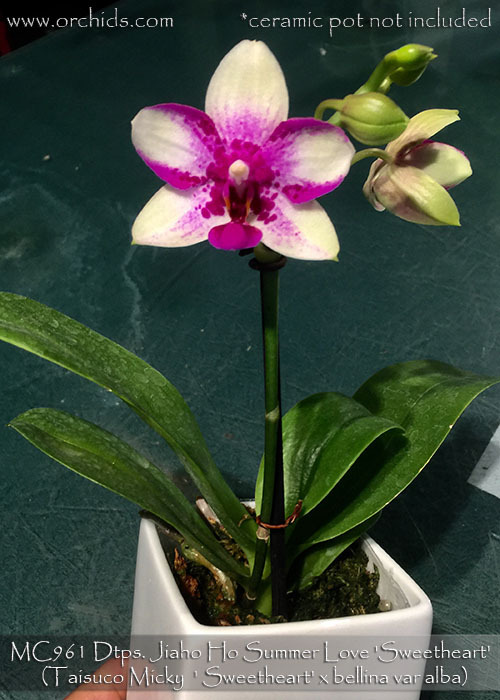 This great new hybrid is like a Phal. Taisuco Micky on steroids ! 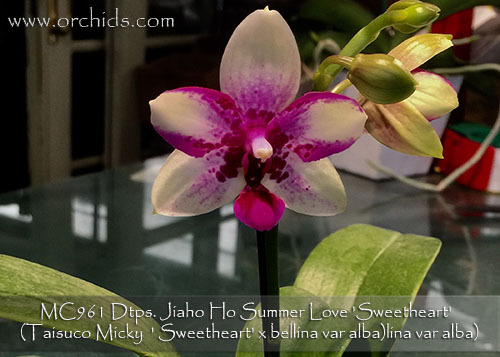 Its pollen parent is the alba strain of Phal. bellina giving it an amazing fragrance. A vigorous grower and disease resistant, this 'Sweetheart' clone is larger in size with beautiful broad leaves due to the influence of Phal. bellina. Its flowers carry extremely heavy substance, initially opening with a soft green background which becomes white as the flower matures, creating a dramatic contrast with its emboldened harlequin-influenced flaring and flush on all its segments. Highly Recommended ! Sweetheart , Note Delightful Fragrance , only 6 available.